1. Open an existing project and click on Documents in the Start tab, to open the document list. 2. Choose All Documents or just a subfolder from the folder structure on the left side. 3. Open the Settings tab and click on Clean Up Document List. 4. Click on Yes in the new window, to permanently delete redundant or unnecessary data. 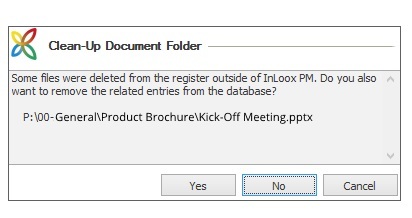 Clean up the document list in InLoox PM | InLoox 9 for Outlook • Copyright 1999-2019 © InLoox, Inc. All rights reserved.